See Chicago with fresh eyes when Kurt Perschke's RedBall rolls into town. 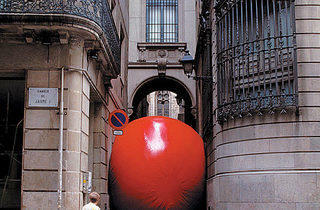 Photograph: Kurt Perschke SEEING RED The RedBall squeezes into Barcelona&#8217;s Gothic Quarter in 2002. What’s bright red, 15 feet tall, 250 pounds and goofier than a cop on a Segway? It’s the RedBall, a public-art project created by NYC-based sculptor Kurt Perschke that will tour Chicago through September 25. 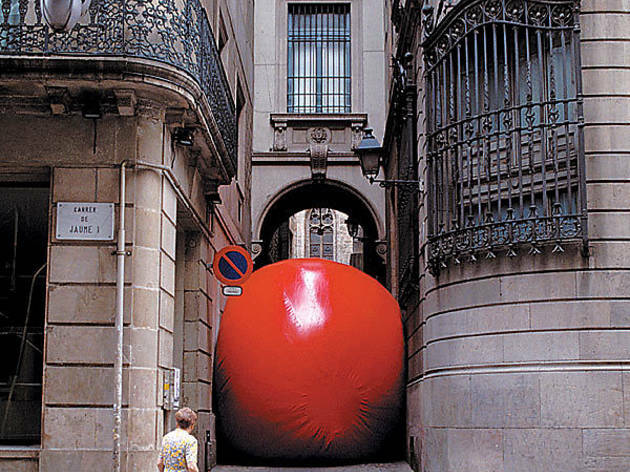 Since 2001, Perschke has squeezed the inflatable, vinyl RedBall under a concrete overpass in St. Louis; released it on the streets of Busan, South Korea; and witnessed schoolgirls hurling themselves against it in Sydney. The artist also has brought the RedBall to Barcelona; Portland, Oregon; and Scottsdale, Arizona. He says residents of each city react to it differently, revealing something about local culture in the process. Perschke traveled around Chicago for weeks this June examining potential sites, making study drawings and conducting a few test runs. He chose approximately 16 locations, based on their “physical dynamics, architectural space and street life.” The RedBall will spend one day at each spot, beginning with Millennium Park on Monday 1 and ending at the Chicago Cultural Center. Its schedule also includes the The Field Museum; Hyde Park Art Center; Federal Plaza; the LaSalle Street Bridge; and the Seventeenth Church of Christ, Scientist (55 Wacker Dr). 1. Let teams of people toss the RedBall at Claes Oldenburg’s Batcolumn sculpture (600 W Madison St); the 100-foot-tall steel baseball bat must be itching for a game. 2. Poise the RedBall atop Buckingham Fountain (Columbus Dr and Congress Pkwy) before the landmark shuts down for renovations on Tuesday. An American river-rafting-equipment company fabricated the RedBall, so it should be durable enough to survive the hourly 150-foot-high water jets. 3. Use the RedBall to play fetch with Wiggly Field’s (2645 N Sheffield Ave) canine visitors. Just don’t let it crush a Trixie’s yappy teacup pup; that would be tragic. The RedBall will appear at various sites throughout Chicago Monday 1–September 25. For a complete schedule, visit redballproject.com.